Featherdale Wildlife Park is Sydney’s premier Wildlife Experience! We’re open 8:00 am to 5:00 pm, every day of the year (Excluding Christmas Day)! The Park was opened in 1972 by Bruce and Margaret Kubbere on Margaret’s parents’ 7-acre plot, which had previously operated as a poultry farm. Today the Park is owned by Elanor Investors Group and has developed into one of Australia’s finest tourist attractions in Greater Western Sydney playing an important part in the growth of the local and state economy. Featherdale provides a home to over 1,700 Australian native animals from more than 250 different species and serves as Australia’s largest native collection. Focusing solely on native animals, at Featherdale you will find the largest collection of koalas in New South Wales, 3 open space enclosures filled with kangaroos and wallabies, as well as loads of other iconic Australian animals, such as dingos, echidnas, wombats, bilbies, Tasmanian devils, reptiles and a stunning collection of birds from Australia and around the world. 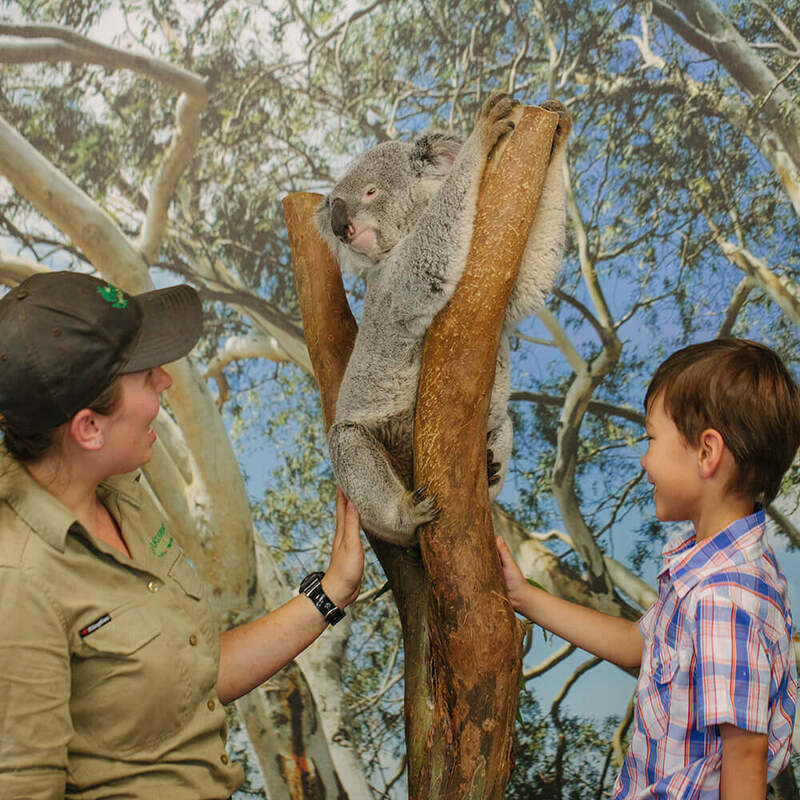 If you’re looking to meet a koala, you can enjoy a Personal Koala Encounter in the Koala Sanctuary, where you will have the opportunity to touch the koala around it’s lower body, have a chat with an expert koala keeper and take home a great photography pack. You can purchase this experience upon arrival or inside the Koala Sanctuary. Pricing commences from $25 for up to 4 guests and excludes admission. This pricing is correct at time of publishing. (December 2017). If feeding kangaroos and wallabies is the aim of your game – you’re in luck! For $3 per cup, you can stroll around our 3 walk-in enclosures and enjoy meeting our friendly macropod friends. Please take note of the refuge areas within these enclosures and do not enter restricted areas, as these areas are designed to allow the roo’s to rest. Featherdale is home to 12 species of macropod (kangaroo), including Eastern Grey & Kangaroo Island kangaroos, Agile/Swamp/Tammar Wallabies, Potoroos and the world’s happiest animal – the Quokka! Featherdale is home to the world’s largest collection of Australian bird species. From black-breasted buzzards to emus to little penguins, the park plays an integral role in the preservation and enrichment of hundreds of birds from all around the country (as well as some notable exotic species). Dare to enter the Reptilian Pavilion and explore the depths of our collection of snakes, pythons, lizards, monitors, turtles, frogs and spiders. Don’t miss the Inland Taipan exhibit, showcasing the subtly of the world’s most venomous snake. We also have our Private Reptile Encounters at 1.30pm everyday, pre-booking is required. Featherdale houses over 30 endangered or vulnerable species including Tasmanian Devils, Greater Bilbies, Southern Cassowary, Quolls and is participating in protecting the Plains Wanderer, an incredible bird on the verge of extinction.